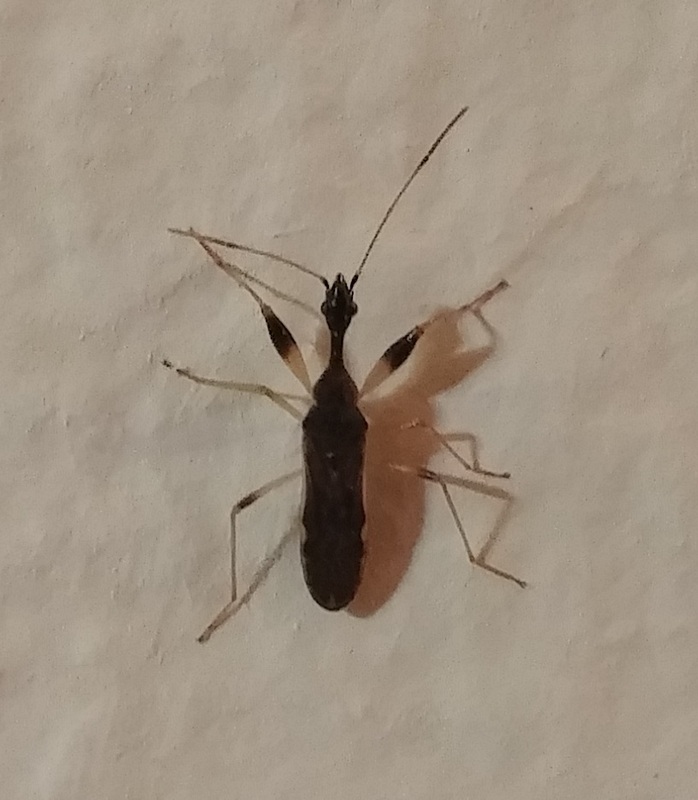 What is this insect that has invaded my home in Texas? After the recent floods in central Texas this past weekend I noticed my that bedroom has suddenly been infested with these small insects that have climbed in through the window. Previously, the hole in the window was used by ladybugs who hatched larvae in the room (they didn't survive long). However, these insects have been here for 3 days now. They seem to disappear at odd times during the day (haven't nailed down a pattern yet) and return a bit later. There are roughly 20-30 of them in my room at a given time. They don't do much and seem very uninterested and passive, mostly just flying around or meandering across the walls on and off. Some of them have wings and others do not (that or the wings are hidden and they just aren't using them). I would like to identify what this insect is so I can find a way to get rid of them. A picture is linked below. Note in the picture that the white-ish segments on the leg are actually closer to yellow in color. Nice picture! Generally, the body plan of this guy indicates Hemiptera (the 'true' bugs), but the long neck is a bit strange, so a google image search for "Hemiptera + long neck' brought up this strong candidate. It looks like it's distributed in Texas, and is in fact, named for that distinctive neck: "The Long-Necked Seed Bug". Not the answer you're looking for? Browse other questions tagged entomology species-identification or ask your own question. Does anyone know what this living creature is? Why are insects unafraid when you tap at them from the other side of glass? Insect identification - is it a bed bug?